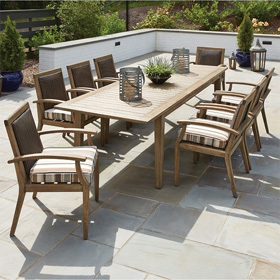 A natural fit for luxury poolside layouts and commercial resort furnishings, this set features three Baja Stackable Sand Chairs with convenient stackable frames and low-maintenance vinyl strap surfaces. Durable and easy to clean, these casual lounge chairs are tough enough for saltwater and lakefront environments yet designed for easygoing all-day comfort. Chairs 26.00"W x 28.25"D x 32.50"H 12 lbs.